In part 1 I touched on the theory and the design process of building the Legacy. In this post, I am going to dig a little deeper into the construction process of the Legacy. Due to length and detail, this has now become a 3 part blog. 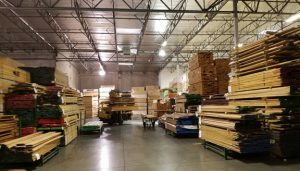 Like every piece we create, the Legacy started with me at one of our lumber suppliers hand picking the boards to be used. After delivery of the material, I proceeded to start laying out the project on the individual boards. This is an often overlooked process and I have learned that the time spent here pays off in the finished project. This is where I started matching boards for color and graining also paying attention to avoid potential defects such as cracks and knots. 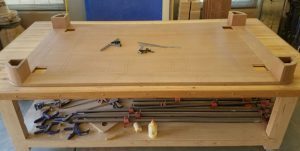 The next step is to start rough cutting, per the materials list, and prepare for panel glue-up. This also gives me a final chance to match individual boards up to ensure the best possible final appearance. In several species of wood, this is a very critical step, not only for appearance but for the stability of the glued up panels. 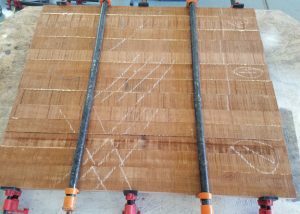 Since we are using quartersawn material for this table we do not have to worry about alternating growth rings as we do on the more common flat-sawn material. After the panels are glued up and the boards have been rough cut I allowed two weeks for acclimation to my shop’s conditions before proceeding to cut to finished size. Unfortunately, this step seems to get left out by a lot of manufacturers in their rush to get products out the door faster. 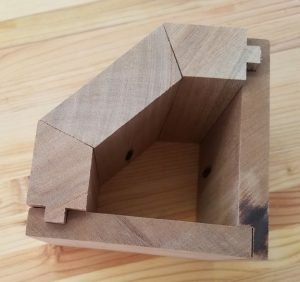 I still believe that it produces a more stable finished product as it allows for the wood to reach its equilibrium before beginning the process of cutting to size. Cutting to the finished size is the step where I get to start getting a feel for what the final piece will look like. 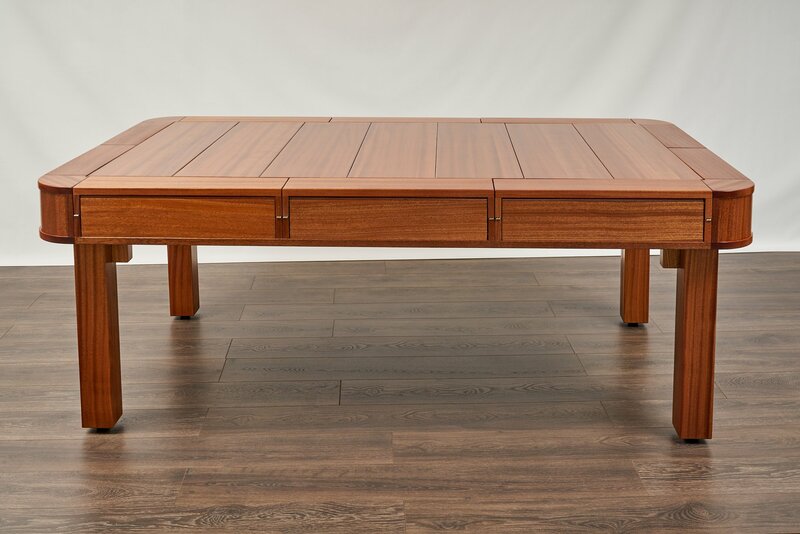 The Legacy table has about 116 individual components that need to be cut and milled but none are more prominent than the rounded corners of this table. In the Geek Chic version of this table, the radiused center block was cut from a solid piece of wood. 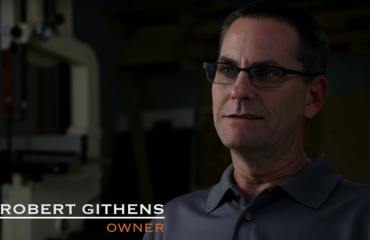 They actually made a pendulum that swung the block over a router table to create the radius…pretty amazing. Unfortunately, in my research, this was also an area of concern from owners because of cracks showing up. This is caused by the outside of the large chunk of wood release or absorbing moisture at a different rate than the inside. To avoid this I decided to glue up some thinner material then cut the radius on the bandsaw…no pendulum here. As you can see in the picture above you cannot even tell that the corner is made up of 3 individual pieces. This gives the corner just as much strength as the original design but minimizes the effect of climate changes on the finished product. After completing the corners I moved onto the carcass assembly. This needed to be done on a large flat surface that gave me the ability to clamp certain parts as needed. Fortunately, my glue up table that we built earlier this year was large enough to handle a table of this size. 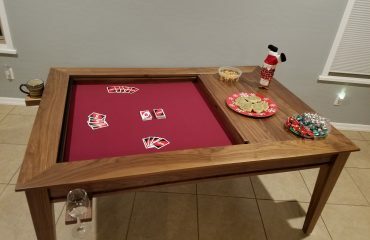 The particular nature of this table required us the use of several different joinery techniques. 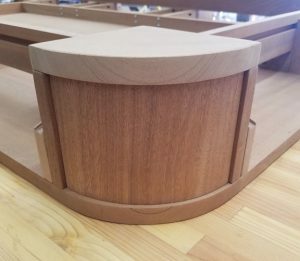 I used rabbit joints for joining the bottom panel to the bottom rails, joinery biscuits and pocket screws to join the corners to the bottom rails, and pocket and through screws to join the supporting structure to the floor and side rails. The legs attach to the table by protruding through the floor and getting bolted to the supporting structure. This design also allows for the corners to rest directly on the leg distributing the weight of the table more evenly. At this point, the table’s overall size and dimensions start coming to life. The focal point of creating the side rails was to keep the grain continuity throughout the drawers. This involved several additional steps, but as I mentioned in part 1 I felt it was a deficiency in the original design. In order to do this, I had to mill the side rail to 1” thick. I then ripped off the top part, above the drawers, and milled it to ¾” thick creating the outside ledge that the game vault floor would rest on. After that, I cut out each drawer front from the lower piece and milled them down to ½” thick. I then reassembled the entire side rail, using glue and clamps to put the entire assembly back together. A final pass through the wide belt sander and the rail was ready to go. By this point, I have around 40 hours into the table which is about ⅓ of what I projected for the project. It is able to stand on its own legs and I really have a feel for the overall dimensions and feel great about the proportions of its overall size. In the next blog, I will go into building the tilt down playstations, constructing the drawers, the top leaves, and finally the finishing of the table. 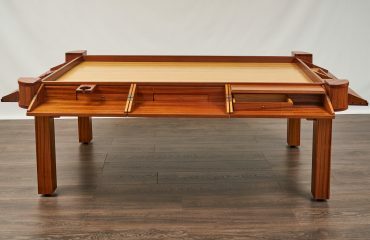 Please leave a comment below or use our contact page if you have any questions or want to know more about how you can become the owner of a legacy table.